Last week, Bedford + Bowery ran a piece I wrote about H.P. Lovecraft. In particular, the article–which you can read here–contains four observations that I feel are too frequently ignored in conversations about the writer’s troublingly nativist worldviews. My article was a reaction to a string of recent pieces by Laura Miller, Phenderson Djeli Clark, and others that I thought unfairly characterized Lovecraft fans as unwilling to acknowledge the writer’s early prejudices. In my article, I tried to make the case that– to the contrary– Lovecraft fans are very aware of (and, frankly, troubled by) the Old Gent’s views. I also pointed out–as, somehow, nobody else had bothered to– that Lovecraft’s views demonstrably changed as he aged. 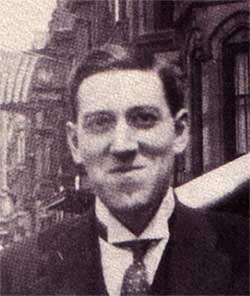 By the end of his life, Lovecraft was a Roosevelt-supporting socialist who regretted his former opinions and gave no evidence of being a prejudiced person. You can read the article and decide if you agree with me or not. Anyhow, there was one item to which length did not allow me to respond. And that was the excellent “‘Don’t mention the war.’ Some Thoughts on H.P. Lovecraft and Race” by David Nickle. In this piece– which is worth your time to read– Nickle shares his experiences with the reluctance (or even recalcitrance) of Lovecraft fans to discuss the author’s prejudices at horror conventions. I would like to, here (what else are blogs for? ), say what I could not fit into my B+B piece. And that is this: I believe Mr. Nickle when he says that Lovecraft fans have, repeatedly, declined to spend panels at horror cons talking about HPL’s bigotries. But I disagree with his apparent conclusion that this is because the fans are somehow “in denial.” I posit instead that fans don’t want to talk about that topic because it’s boring. I’m not surprised that most of HPL’s fans would rather spend a panel talking about any number of the author’s majestic and monstrous creations than the xenophobia in his early personal correspondence. But being bored by something is not the same as disagreeing with it, or refusing to accept that it is true. I conjecture that if Lovecraft fans were given the choice of either a panel about HPL’s prejudices or a panel about, say, stamp collecting, they’d choose the Lovecraft’s prejudices panel every time. It’s hard to conclude things from how people act in situations like horror cons where there is lots and lots of fun to be had. I agree Scott, while our literary heroes were not perfect, I don’t get involved in forums about their politics or choice of religion. I don’t pick movies or music on those criteria either. Should we go back and annualize the faults of other writers while we’re at it. That list would get very extensive because creative people don’t fit within the common parameters that society sets forth. On the other hand if you were to have a symposium on racism and HP’s name was brought up that would make more sense, but then who would attend such an event?